NEW!! BETTER AND BIGGER LOCATION TO SERVE YOU. Bobby Lynn’s Marina, offers the very best in WATERFRONT RV CAMPING, BOAT SLIPS, BOAT STORAGE, LODGING, DRY STORAGE, and CHARTER FISHING. RV SITES offer spacious lots & full hook-ups(50amp) with wet slip to keep your boat moored just outside your rig. Back down launch on site for guests. We offer long and short term sites. Daily, monthly and yearly terms. Pull through sites available upon request. Bath house and Laundry for guests only. WET SLIPS -are easy to access and we offer several different sizes to accommodate large and small vessels. Dockside fuel and Ice are available. HOISTS – we have several to rent or you can lease a slip and install your own. Piers and pilings and utilities are in place already, just install and your done. We can help in that process as well. DRY STORAGE – Our storage bays are 12X36X14’ clearance. They rent on a yearly basis. Pricing includes free launching and an overnight wet slip is available. HOUSEBOAT SLIPS – Shore power available on request. Rates vary on size. CHARTER FISHING – Inshore and Offshore trips available. Any size party is welcome. OUR ADVANTAGE TO YOU IS: Minutes from Port Fourchon - Bell Pass to offshore and surf fishing. 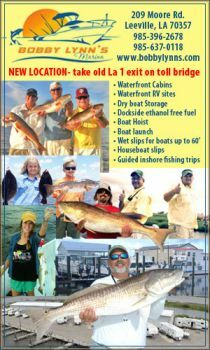 Protected waters to fish on windy days behind the barrier islands of Grand Isle, Timbalier, Leeville and Golden Meadow minutes from your site. Charter trips in your boat to learn the area are available.